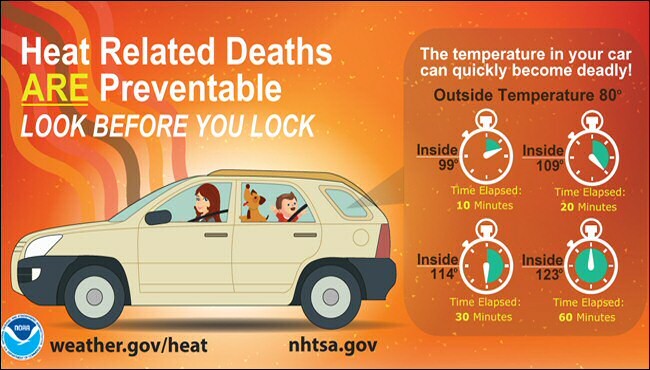 More than 36 children die in overheated cars every year in the United States, more than 600 deaths since 1998. More than half of those who left children alone in vehicles did so unknowingly. Other reasons cited: the child got into the vehicle on his or her own (32 percent), child was knowingly left in vehicle (12 percent) and circumstance unknown (2 percent). Pets – Leave your pet at home on warm days if, bring plenty of fresh drinking water and bowl if they have to travel with you. Protecting children is everyone’s business! Per our Ansbach Directorate of Emergency Services, if you see an unattended child in a vehicle immediately notify 110/112! Need more information? Call your installation Safety Office, 468-1670.